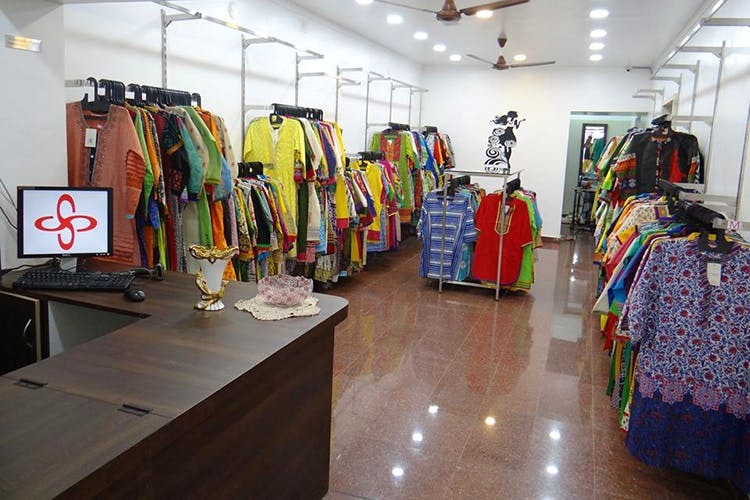 All you girls of Christ and Jyoti Nivas college, and pretty much anyone who needs kurtas, palazzos, salwars, Patiala pants and waistcoats, hit up this gem of a place, Scintilla. Prices start at an easy INR 199. It's the extensive collection of college-ready and everyday ethnic wear that starts at a mere INR 199 that makes this such a cool budget boutique. And just because it starts at INR 199, don't go thinking you will find boring ones. The cotton kurtis, which they specialise in, are trendy and available in all design, size, and length. Fans of prints, you'll plenty of geometric, ikkat, kalamkari, paisleys, and abstract along with solids like yellows, reds, and blues, and ones that come with embellishments and embroidery. Apart from kurtis, the also stock up on leggings, Patiala pants, palazzos, reversible waistcoats that come with kalamkari prints, and Indo-western tops that are very office-friendly. The tops come with pretty prints There's a collection of stoles and dupattas too. If you are looking for something more Ethnic Day or to wear for a reception but don't want to spend a bomb on, the collection of salwars should sort you out. Nothing too grand, but enough to slay the look. And within budget!